At the age of 13 I was told that I would be blind by 21. That was in 1977 and obviously I can still see. Well… mostly (two operations, some pain and a lot of discomfort later). And what does that have to do with art? Well, a fellow blogger wrote a post about what constitutes a true artist (do you have to be such a tool). The post was actually about someone else’s post and it discussed whether a real artist used tools such as grids etc to create art. This is a detailed response to that excellent post. By the way, talking so publicly about the limits of my vision is something that I have never done before. To be honest I have always been deeply offended by those people who say that the only real artists are those who draw their art freehand. You see, my eye disorder makes the world look very distorted and blurry, with halos around bright objects. In my case I also see multiple instances of the same objects that all overlap. In my left eye I can only read unaided at 4cm. With current glasses I can read at about 20cm. Luckily with my right eye the shadow instances of objects are not quite so pronounced and so I can read at almost normal distances in my glasses if I really squint and concentrate. Things are still quite distorted, and I suffer constant headaches, but I am used to that. This disorder is called Keratoconus and it essentially involves having conical corneas instead of hemispherical ones, along with a number of stigmatisms. Wonderful! A lot of people with this problem suffer increased anxiety too (a genetic partner), and this can be quite crippling. 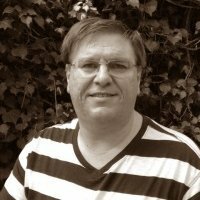 I have met a number of people with the same degree of disability as myself who simply cannot work, mostly due to the anxiety. In my case, I still have excessive anxiety over things, but I can cope. In fact I am reasonably good at hiding it. But I have no intention of going into those life and work issues. Today I am writing about being an artist with this problem. Firstly, I cannot perceive objects as they actually are. This makes it very difficult to draw an accurate representation. Hence my drawings and paintings tend to be slightly off. I certainly have trouble with perspective. 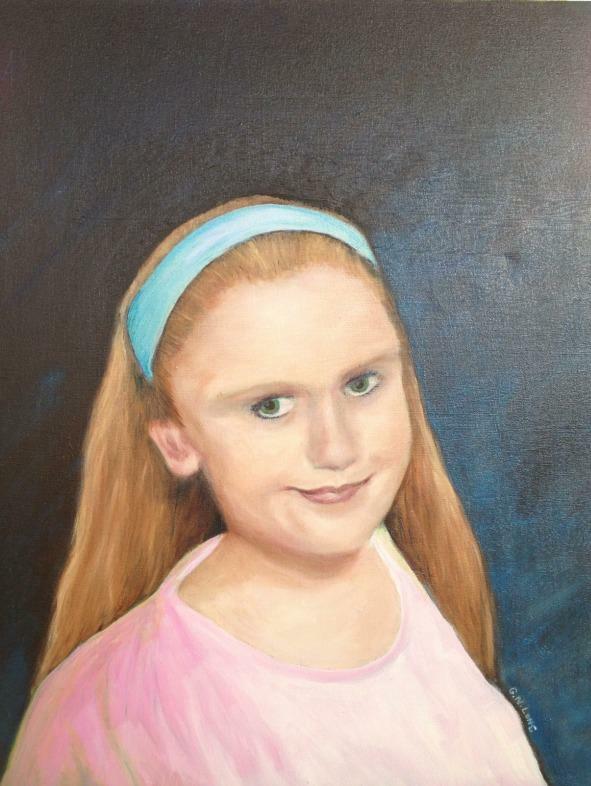 To show you what I mean, below is a painting of my daughter. She is a bit stretched and distorted, but I still love the painting anyway. And because I am effectively short-sighted, I need to paint and draw from photographs. So even if something is right there in my house, I will take a photo and refer to that rather than the real thing. When I do this I can achieve less distortion in my pictures. Below is my take on an Australian landmark called The Three Sisters. I went there, took a photo and then used that as a reference. Another tactic is to trace the outline of objects during my preliminary sketch. That gives me a framework into which I can places components of the image. Secondly, because things have a tendency to blur into neighbouring objects, I tend to like bright but differing colours next to each other. It helps me distinguish things apart. When I paint I tend to use bright colours on different objects so I can clearly delineate the different parts of the painting. Hence my skies are usually blue in a distinctly non-realistic manner. My grass and foliage is also strong. Sometimes paintings do turn out better than expected. 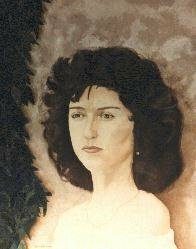 Here is one I painted at 23 (two years after I was supposed to be blind). It is of my then girlfriend and now wife. Over the years people have criticised me for painting slightly distorted images with strangely bright colour. If they read this then they will now know why I do this. However I persist. Painting is not about being good, its about the joy of visually expressing feelings. In the 1990s computers, and more importantly computer graphics, came along. These were the tools I was waiting for. Using products like Poser, Bryce and more recently DAZ Studio, the whole issue of distortion went away. The models are there for me to manipulate and turn into images. Some call this cheating in art because I am using other people’s models. I disagree. Think of photography. No one would suggest that some photos are anything but art. They are beautiful and express such strong emotions. Yet the person exists outside of the photo, as does the scenery and the clothes and other props. The art is in the composition and colours etc. For me, using DAZ Studio is the same as photography. Naturally some computer artists completely draw things from scratch using Paint programs, others sculpt objects from scratch in tools like Blender, Maya etc and… well, you get the picture. All these things are art. Also, because the act of creation happens on a computer screen I can get my face in really close to see what I am doing. I still like bright colours though. Force of habit perhaps. Fact is, there is no reason why someone with Keratoconus cannot be an artist. With computers it is easy to see what you are doing while you create. I have never let Kerotoconus define me. I am determined that it won’t limit me (that’s why I mentioned the four university degrees earlier). And I try to avoid telling workplaces (unfortunately not always possible) so that I get treated normally. Anyway, Keratoconus aside, artists should feel free to use whatever tools that they want to achieve their art. It is not the right of others to judge them. Art is creation and tools are part of what make us human. They assist us, enhance us, extend us. How can that not be good? I think that a substantial part of being an artist is not what you can create, it is what you can conceive of. Learning how to paint a good reproduction of something – freehand or not – does not necessarily make you an artist. Creating something using whatever tools, that did not exist before except in your own mind, does make you an artist – a creator, not a copier. 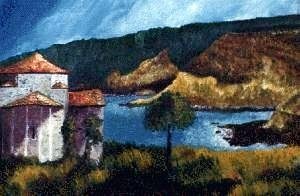 I think your usage of photos to paint from make you a painter, but your use of computer tools to create something that did not (as a whole) exist anywhere except in your mind, is what makes you an artist. I understand the difficulties your vision creates in allowing you to be an artist on the canvas, but the computer tools are those that put the act of creation into your hands. I hear you. I’m heavily myopic (-5 dpt, basically been that way for all my life), and although I wear glasses, the world still looks distorted to me: either because it’s, well, all depth-of-field (and quite a noisy one! Need more pixel samples! LOL), or because the lenses refract light and thus turn straight lines into curves and throw proportion off. I’m not that good at drawing from a static flat copy, though, even when I can hold it close to my eyes unaided; so when I’m forced to use photo references only, it’s always a major headache. It’s somehow easier for me to use videos that, being dynamic in nature, help me to construct a 3D image in my head and draw from there. I have to say, I really like the way you approach colour in paintings. I think it fits along the advice the late great Andrew Loomis was giving to aspiring artists in his books. Any random photo is “realistic”, but a good photo or a good painting is “hyperrealistic”: an image on paper (or even on a computer screen!) has a smaller dynamic range than the light does in the real world, so in order for this limited image to produce the same impression as the real world does, the artist has to play up some features of what he sees and mute others. I think Paul Klee said something along the lines that an artist does not re-create but co-creates. Get this book if you can: http://www.goodreads.com/book/show/2766647-creative-illustration – it reads as if it was written today, and it’s probably the best one for anyone who is an artist, in any medium. I share your problem. I only have one eye, my left, with keratoconus, but I get to add to that a hereditary problem with red/green color-blindness. I don’t feel that any tool an artist uses for any reason invalidates the art. William-Adolphe Bouguereau probably used optical mirrors to put a photo-like image on his canvas which used to make the preliminary drawing. This made his work very realistic. But it doesn’t invalidate his work any more than using a camera makes a photographer less than an artist. Must we paint without paint brushes too? The art is not in the tools, it is in the mind and heart of the artist.